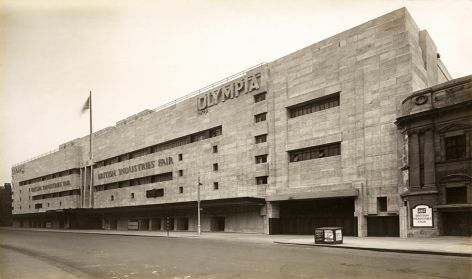 'Exterior of New Empire Hall, Olympia' (1929-1930). Catalogue number: EMB-2-3-67. 'Simpson Piccadilly (Ltd)' (1936). Interior of outfitting department on the ground floor. Photograph: Arkin Bros Commercial Photographers. Catalogue number: EMB-2-7-11. 'Blackpool Pleasure Beach'. Funhouse (1953). Catalogue number: EMB-2-11-3. 'Royal Corinthian Yacht Club'. Burnham-on-Crouch (1931). Catalogue number: EMB-2-14-4. Joseph Emberton (1889-1956) was one of Britain’s most significant architects during the inter-war period. 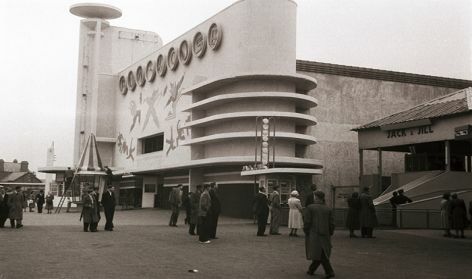 His projects, which introduced modern design to broad audiences, include kiosks for the British Empire Exhibition at Wembley (1924), the British Empire Hall at Olympia (1929) and Blackpool Pleasure Beach (1935-39). 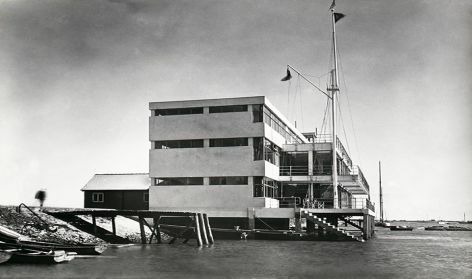 Emberton designed the striking Royal Corinthian Yacht Club at Burnham-on-Crouch (1931) which represented Britain at the Modern Architecture: International Exhibition at the Museum of Modern Art in New York in 1932. 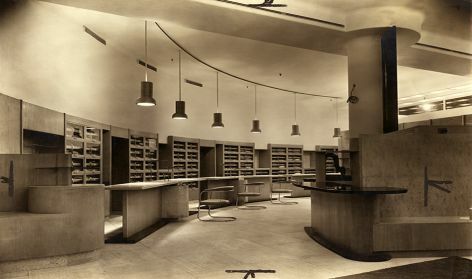 Five years later, two more buildings - the celebrated Simpson (Piccadilly) Ltd. department store (now Waterstone’s flagship bookstore) for which László Moholy-Nagy designed displays, and the Southsea branch of Timothy Whites - were selected by MoMA for the exhibition Modern Architecture in England. Comprising several hundred items, including photography, news cuttings and correspondence, the Joseph Emberton Archive is fully catalogued and searchable online. In 2015, the Design Archives collaborated with Pallant House to produce the first exhibition of his work for more than thirty years. A collection of films created by Joseph Emberton can be accessed via the Screen Archive South East, the public sector moving image archive serving the South East of England, which is also located at the University of Brighton.